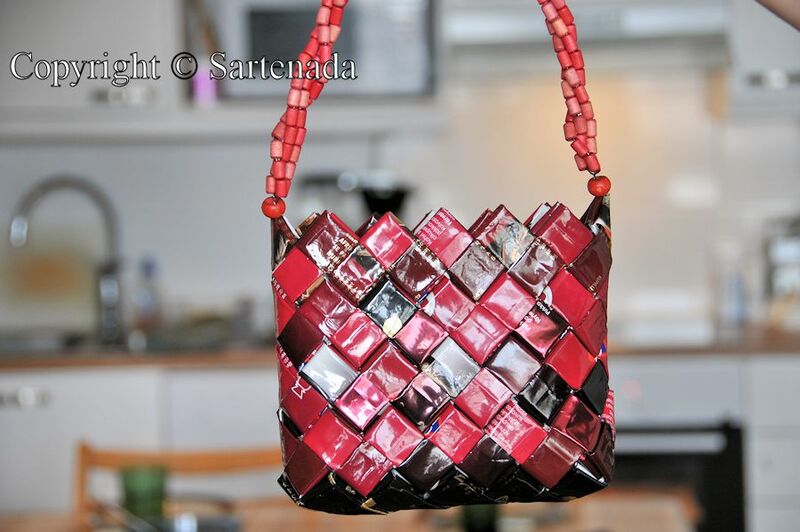 Evening bag made from empty coffee bags. 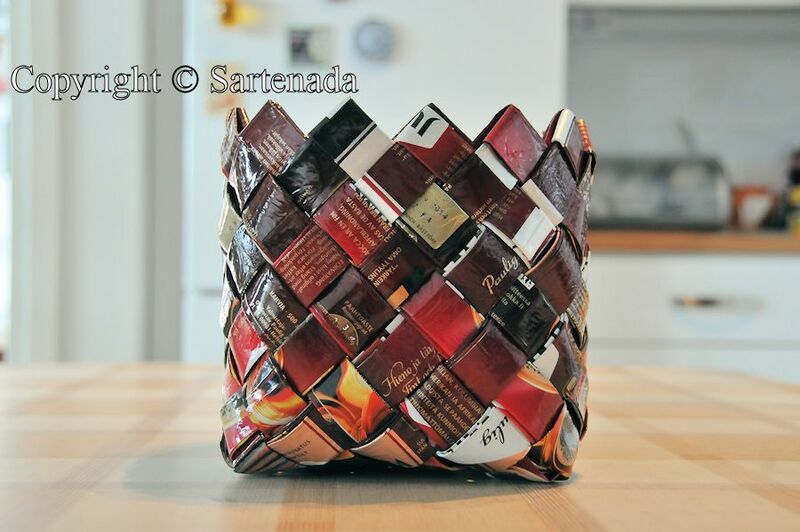 Some of You might remember my post in which I showed how to reuse / recycle empty coffee bags and how to make from them Shopping bags. 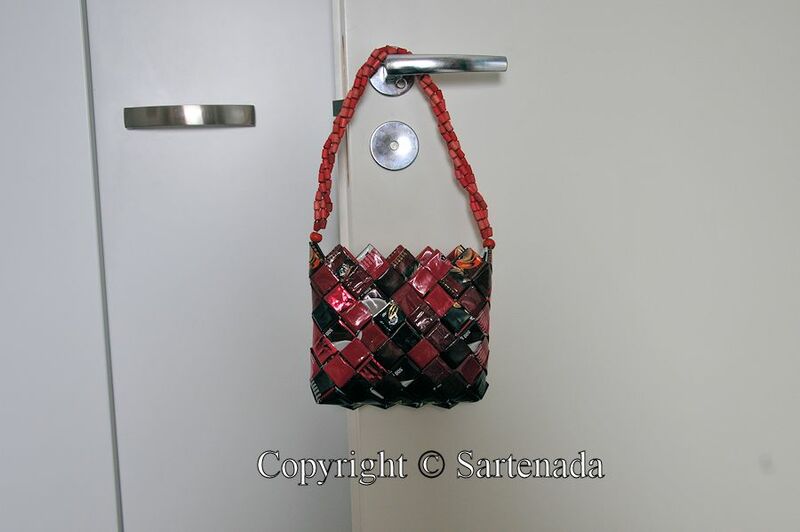 In this post I show the evening bag which my wife made. 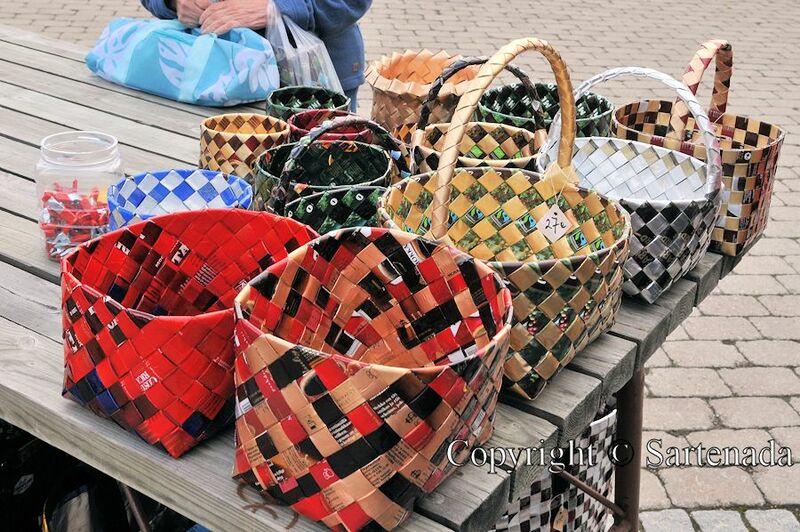 Before showing it, I present five shopping baskets which we saw on a market in a small town called Ilomantsi. 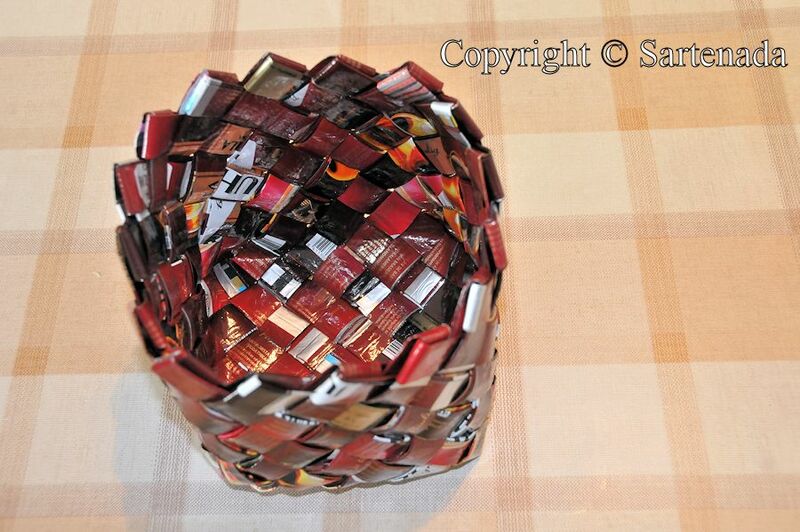 Next six photos show the basket which my wife made when she was newbie. The technique differs from that she used in the first post. 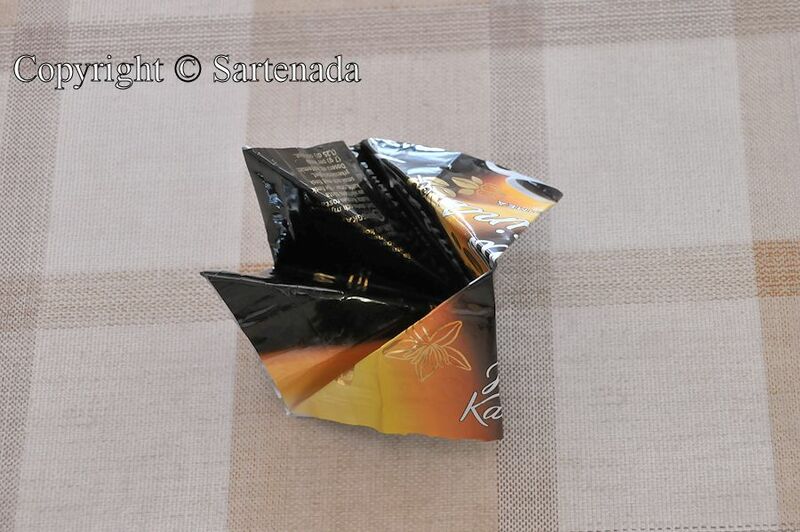 Next eleven photos show how to make pot coaster of coffee / tea pot. These pot coasters were very popular decades ago. I remember that my mother made them already in the sixties. 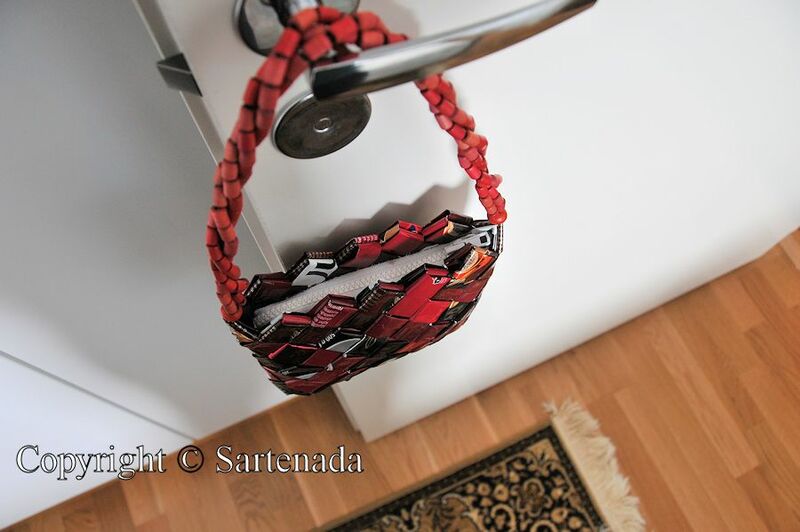 Before last photos I show the Christmas present (scarf and bag) to my daughter made by my wife. Bolso de noche hecho de bolsas de café vacías. Algunos de ustedes pueden recordar mi post en que yo mostré cómo reutilizar / reciclar bolsas de café vacías y cómo hacer de ellos Bolsa de compra . En este post voy a mostrar el bolso de noche que mi esposa hizo. Antes de mostrar que, presento cinco cestas de compra que vimos en el mercado en un pequeño pueblo llamado Ilomantsi. Próximos seis fotos muestran a Vos la cesta que mi esposa hizo cuando era novato. La técnica se diferencia de que ella usó en el primer post. Siguiente once fotos muestran cómo hacer olla de posavaso de café / pote de té. Estos posavasos de caserola hace décadas muy populares. Recuerdo que mi madre los hizo ya en los años sesenta. Antes las últimas fotos Vos muestro el regalo de Navidad (bufanda y bolsa) para mi hija hecho por mi esposa. 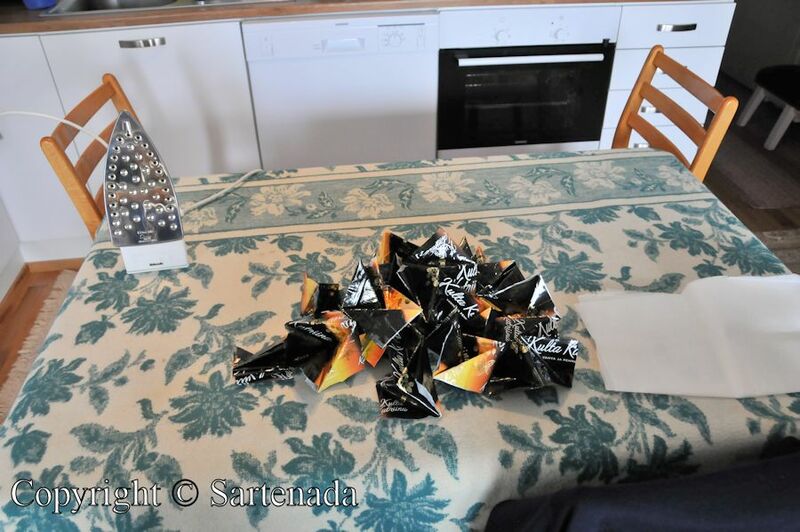 Certains d’entre vous se souviennent peut-être mon post dans lequel je l’ai montré comment réutiliser / recycler les sacs de café vides et comment faire d’eux Sac à provisions . Dans ce post, je montre le sac de soirée que ma femme a faite. Avant le montrer, je présente cinq paniers que nous avons vu sur un marché dans une petite ville appelée Ilomantsi. Suivant six photos montrent le panier qui ma femme a fait quand elle était novice. La technique est différente de celle qu’elle a utilisée dans le premier message. Suivant onze photos montrent comment faire dessous de cafetière /théière. Ces dessous de cafetière étaient il y a des décennies très populaires. Je me souviens que ma mère fit déjà dans les années soixante. Avant les dernier photos je vous montre le présent de Noël (foulard et un sac) à ma fille fait par ma femme. 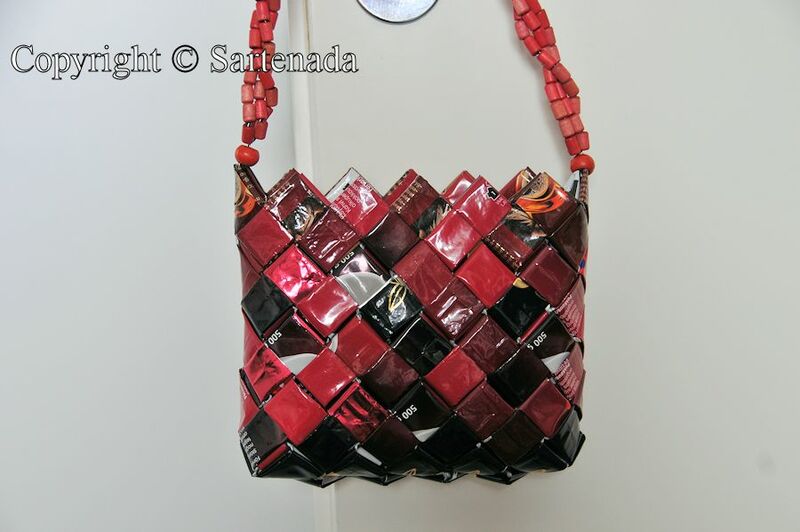 Bolsa de festa feitos de sacos de café vazias. 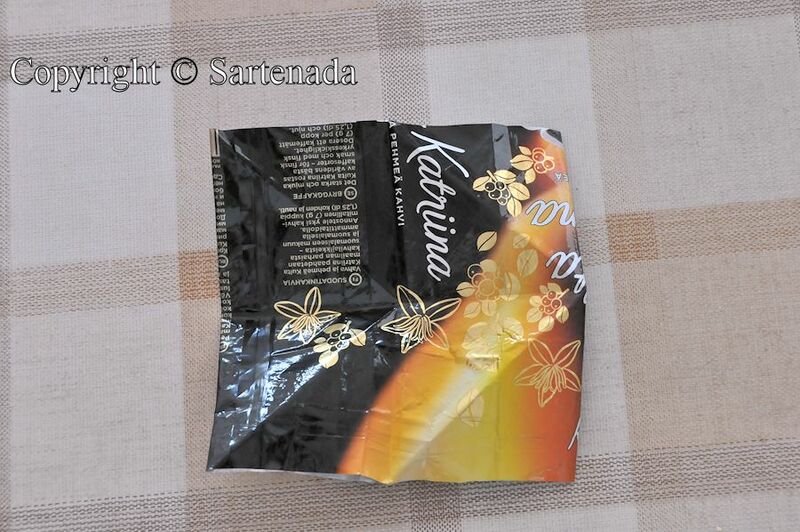 Alguns de vocês podem lembrar do meu post em que eu mostrei como reutilizar / reciclar sacos de café vazias e como fazer com eles Saco de compras . Neste post vou mostrar a bolsa de noite que minha esposa fez. Antes de mostrar isso, presento cinco fotos de cestas de compras que viamos num mercado numa pequena cidade chamada Ilomantsi. Próximos seis fotos mostram a cesta que minha esposa fazia quando era novata. A técnica difere da que ela usou no primeiro post. Antes das últimas fotos eu mostro para Você o presente de Natal (lenço e bolsa) para minha filha feita pela minha esposa. Próxima onze fotos mostrar como fazer bases para potes de café / chá. Estas bases de café eram muito populares décadas atrás. Lembro-me de que a minha mãe fazia já na década de sessenta. Amazing! There is nothing that a skilled artist cannot do! I appreciate Your opinion. I always love skillfully things which people make by their hands. Molto brava tua moglie, complimenti. Thank You praising my wife’s handicrafts. Brava! It’s quite astounding what she can produce with simple materials. My hat is off to your wife. Thank You. My wife will be happy when I tell to her Your comment. I am glad that You left Your comment. ありがとう. I remember perfectly these incredible evening bags in one of your posts of some months ago ! I tried to make something myself , but I’m not so skilful as Anja , I’m afraid! I like them so much that I’ll try again , I ‘m going to tell you about it. Thanks for all your beautiful posts! Thank You. There is no competition between Anja and You. You are making beautiful crafts!!! Anyway, tell when You are ready, I would be happy. Mother who make bag in warm room,,,nice scene! Very nice comment. I am glad that You loved this post. My wife will happy. Your wife is one clever creative gal!!!!! These are gorgeous!!!!! Thank You very much for Your praising comment! Wow! The bags are beautiful and useful. Your wife is so talented and creative! What a joy to read Your comment. Thank you. I feel warm with these bags. Well said, thank You. My wife will be happy when reading You comment. I am happy that You visited my blog and left Your kind comment. Merci beaucoup. 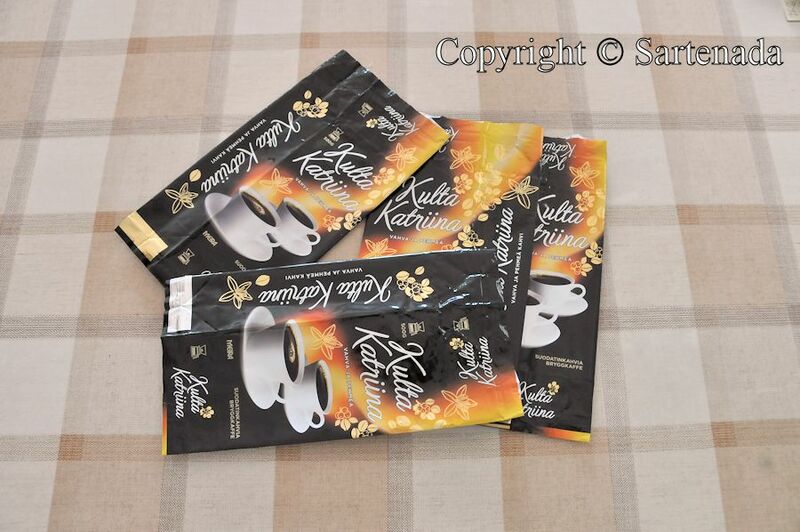 Coffee bags. Who would believe it … The result is fantastic! 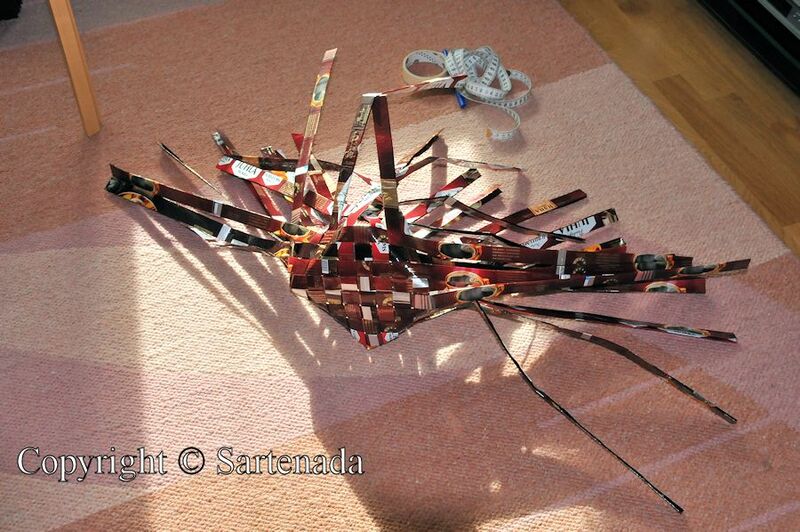 Some time ago when Anja showed how to make the shopping bags I already was very excited about the outcome. 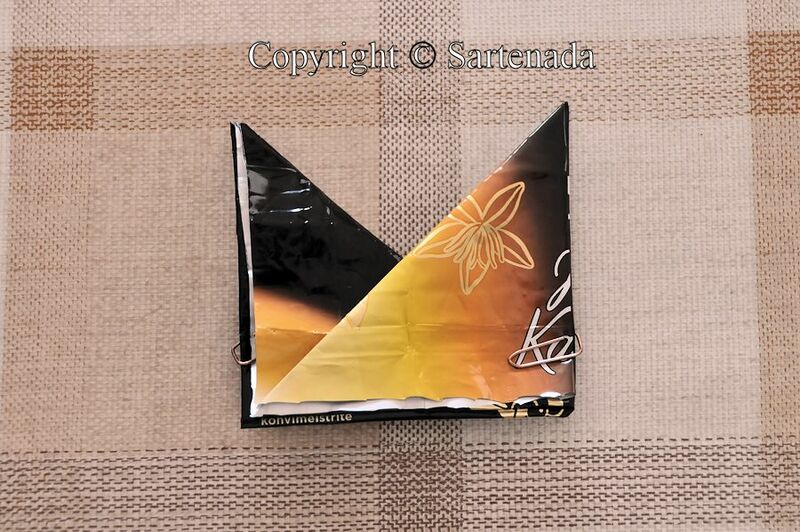 But evening bags are amazing, especially the last one which is destined for your daugther. Rather modern and elegant at the same time and a beautiful colour and pattern. I think you really could take it instead of a Gucci bag! How did Anja fasten the white zipper? Is it possible to stitch? Or do one have to glue it? Matti, let me take this opportunity to thank you for this year’s excellent and interesting blog posts, ideas and photos and let me wish you and Anja a very peaceful and happy Christmas! Wow, what a comment. Concerning Your question how Anja fastened the white zipper, is by stitching. She stitched it twice round the bag. It was not easy not at all. Many times the needle stung her fingers and she said by joking that it required a “lot of blood” because the material is strong and hard. Thank You for Your praising comment. Merry Christmas to You also. I start the New Year by posting “Bear carving contest”. Thanks for your explanation regarding the zipper (Poor Anja! I can imagine how difficult and “bloody” this must have been!). Be sure that carving are interesting! These bags are absolutely gorgeous. 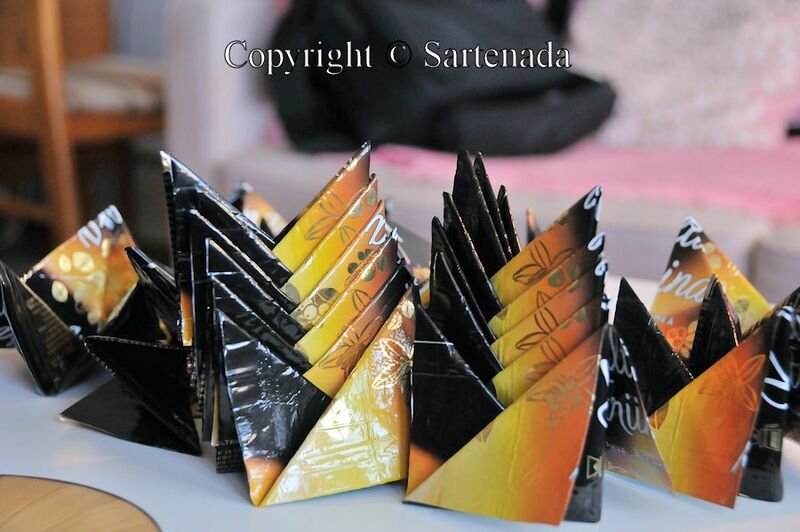 It’s wonderful that they are made from recycled coffee bags. I really like your wife’s evening bag — you have a very talented wife. These kind recycling things are very popular in Finland just now. Thank You commenting. l’effet est garanti, merci pour le partage. Meilleurs vœux et belle fin de soirée. Mon cœur jouir de votre gentil commentaire. Je suis très heureux que vous aimiez ces artisanat recyclés. Merci beaucoup. These are so beautiful! They look very strong – good for shopping or carrying library books. That scarf is gorgeous! Thy are really strong, which make them a little bit difficult make. So nice to read that You loved them. 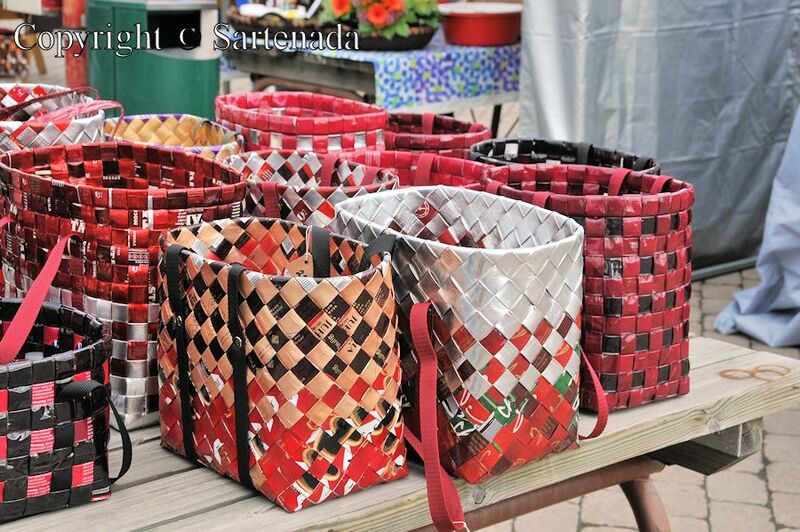 Wow, these are really cool and wonderful way to reuse those bags. I am glad that You loved these. Maybe this is different thinking concerning reuse / recycle. Thank You visiting my blog and leaving Your comment. 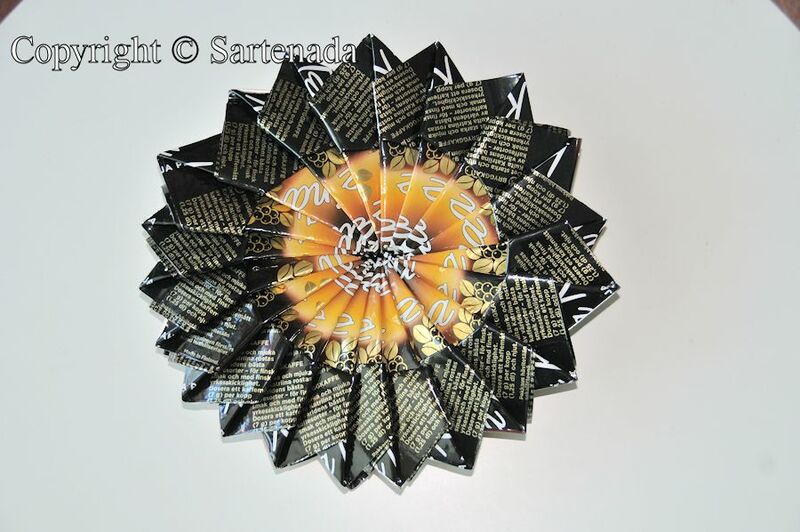 So cool and creative… I much enjoyed your post dear Sartenada. Great photographs. I am happy for Your praising comment. Thank You. Best wishes and happy holidays season also to You. Oh! 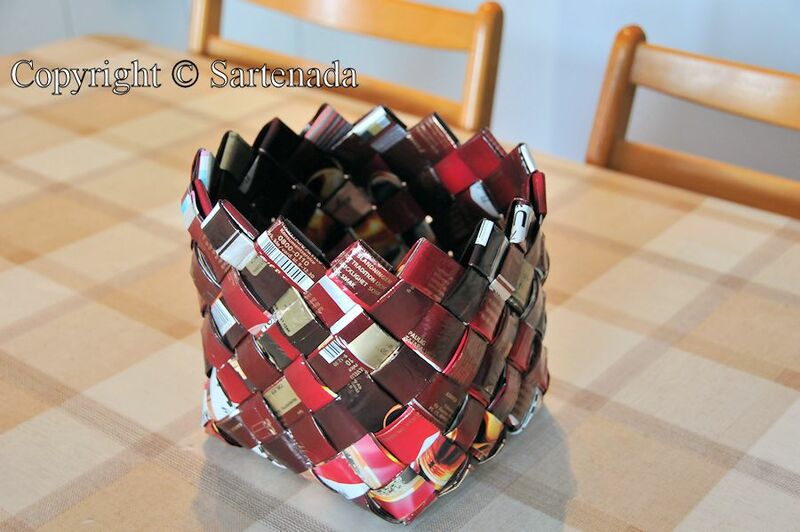 This made from coffee bag ! This is new wave of art ! I think good job ! 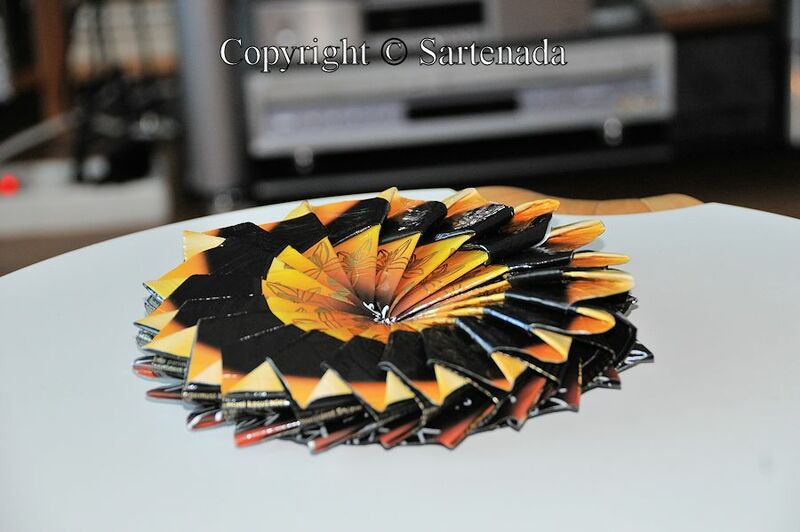 Yes indeed, they are made from empty coffee bags. 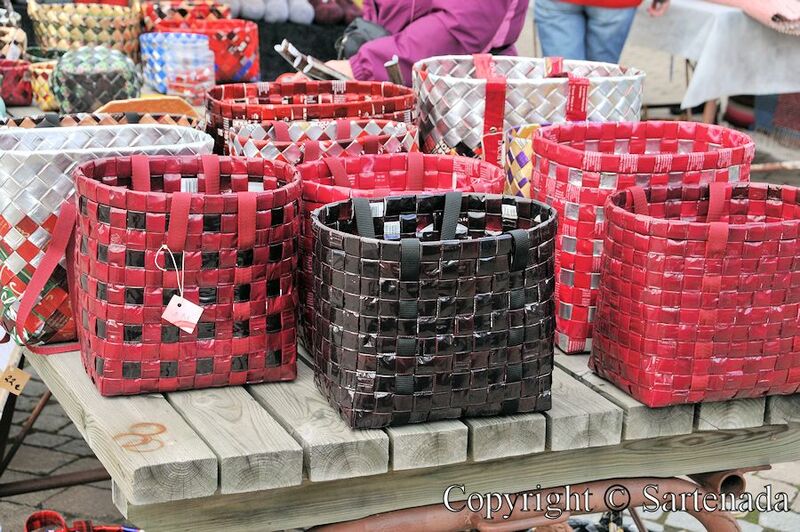 This is very popular in Finland and I hope that someday others crafters reuse / recycle things. Thank you very much for Your visits and leaving every time so nice comments. I am glad that you loved this “different” post. Merry Christmas and Happy New Year to You and not forgetting happy and safe travel! I am happy for You visit and comment. Thank You. How creative and amazing, and eco-friendly. That is exactly two birds with one stone! I’m sure you will have a colourful and creative Christmas. Very best wishes to you both! Thank You for Your praising comment. I think that people who make these has eye for beauty. Have a great start of new week and Merry Christmas. Thank You for visiting this post and leaving so kind comment. Merry Christmas and a Happy New Year to You also. Ta femme n’a vraiment rien à envié à ceux vendus au marché, j’avais déjà été sous le charme de ses réalisations la dernière fois et cela continue. Un grand bravo à elle et les dessous de cafetières sont vraiment cool. J’suis muet en lisant ton commentaire! Je suis heureux pour tes compliments et ma femme aussi. 🙂 Merci beaucoup. Joyeux noël à toi aussi. Bisous. 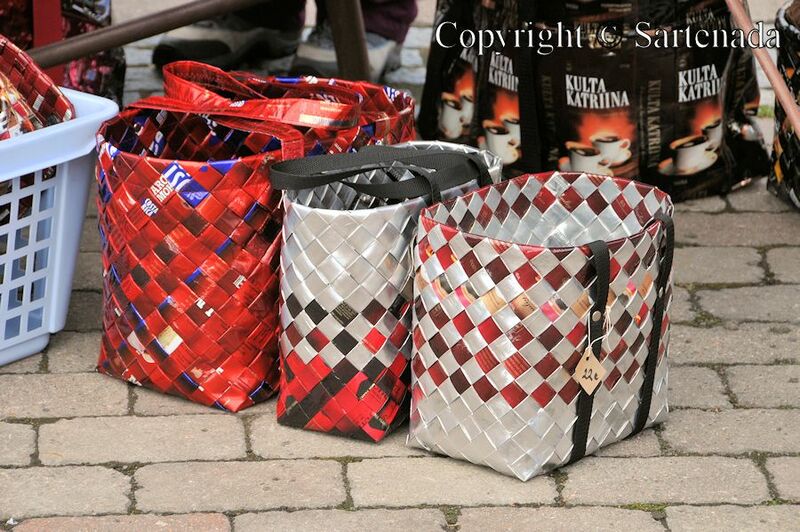 C’est très sincère, j’aime la coté recyclage de ces sacs et ils ne déméritent vraiment pas de beauté grâce à leurs couleurs variées et semblent très solides. 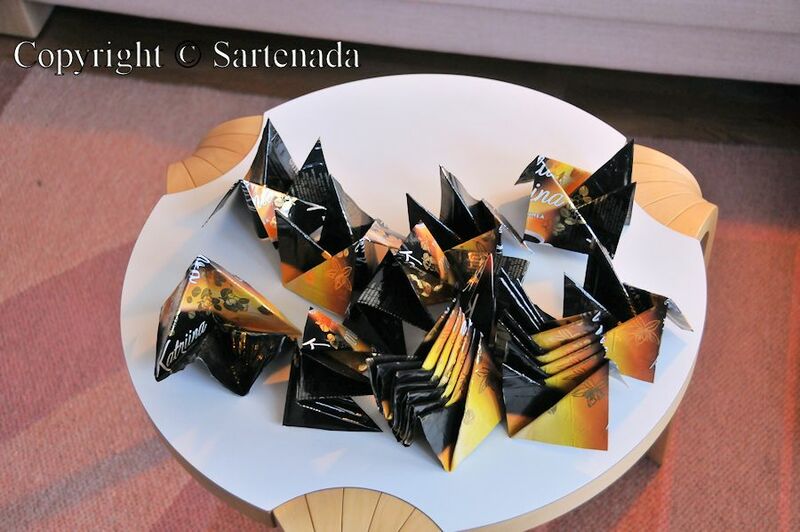 I wish you a nice Christmas time, with a lot of pleasure and opportunities to wear those lovely bags. And: A happy new year! Happy Christmas to You also. Thank You visiting and commenting! Thank you. After photos I had some links. In one of them You get the Basic idea of “How to”. Recycling is a very important issue. 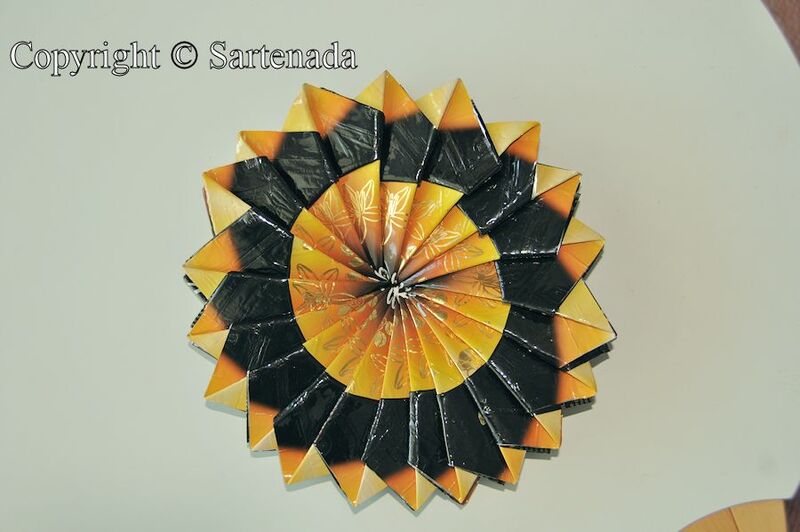 And when the results are so beautiful and unique works of art like these – then recycling is fantastic! 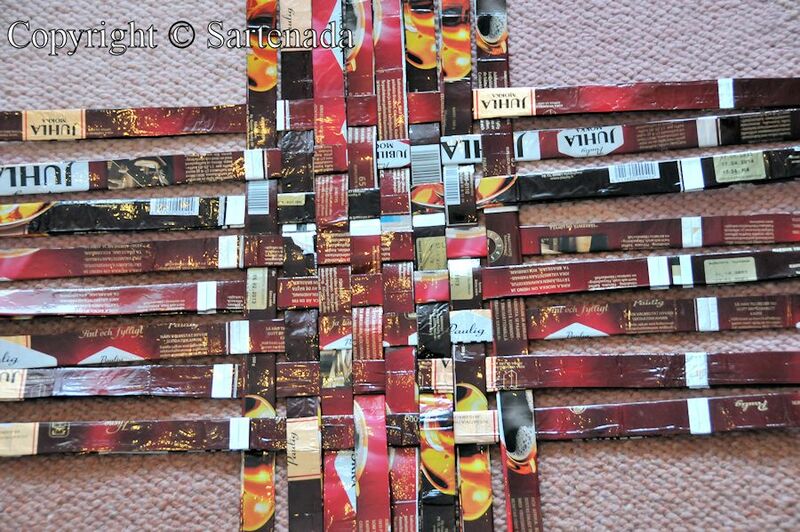 I am very glad that You loved these recycled crafts. Thank you. Happy holidays to You and Yours! Your wife is very talented!! 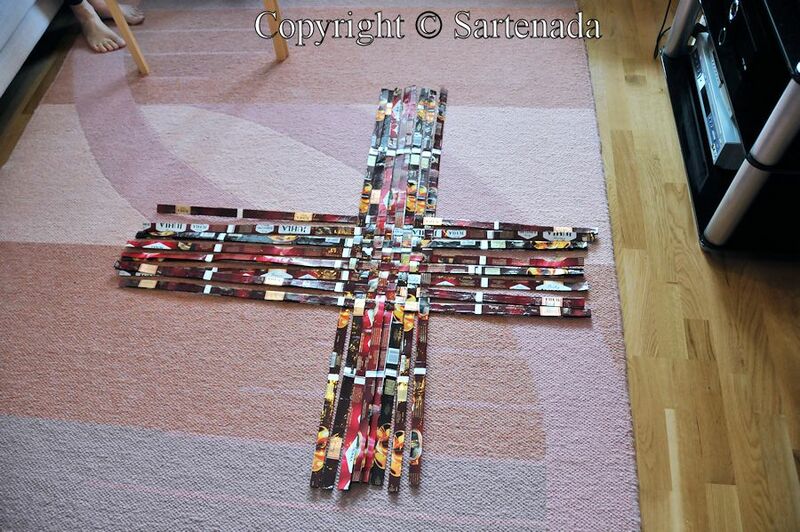 And it’s great to be able to create something beautiful as well as useful from recycled materials! You are so kind and my wife will be happy when reading You comment. Thank You. muy divertido y enteresante. mi esposa Y mi hija ven estas y nos gustan ~ ~ ¡ gracias ! Que alegria al leer tu comentario. Mi esposa es muy contente que su bolsa Vos gustéis. Feliz año 2014. Espero que sea un buen año! Your wife is so talented, and you must be very proud – and rightly so! 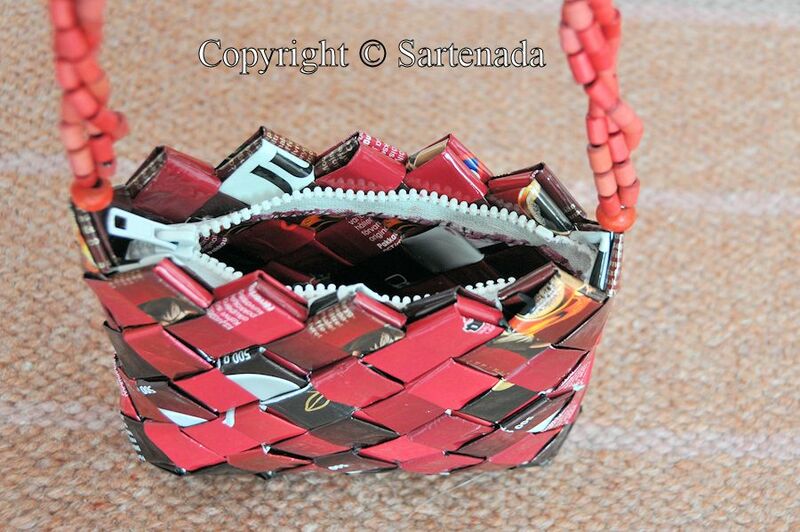 I love what she made and that she used recyclable material too. Happy New Year to you and your family, Matti! What a great joy to receive Your kind comment! Thank You. Happy New Year 2015 to You and Yours! Bonjour Matti, et Bonne et Heureuse Année! This is an incredible idea! I have opened up the other post with the instructions for how to make the shopping bag. It’s brilliant. 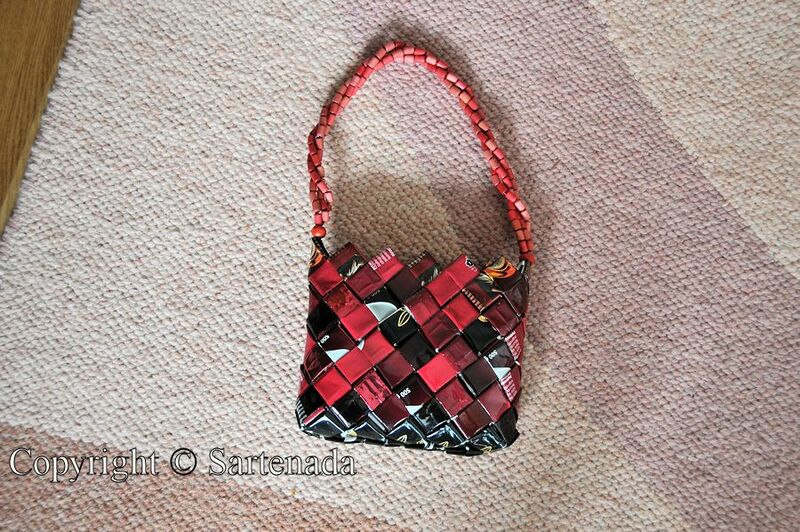 The little evening bag is so sweet and your wife’s present for your daughter is lovely. Hope you had a good Christmas. 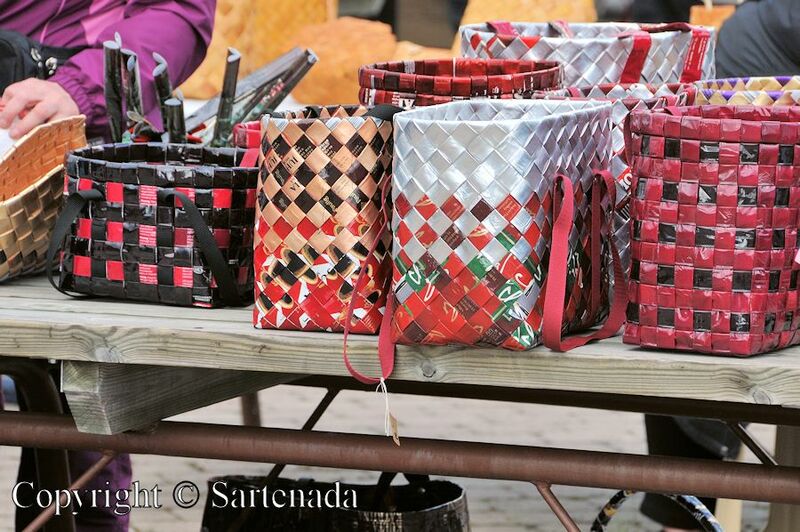 Nice bags, an outstanding idea! Best wishes for 2015! 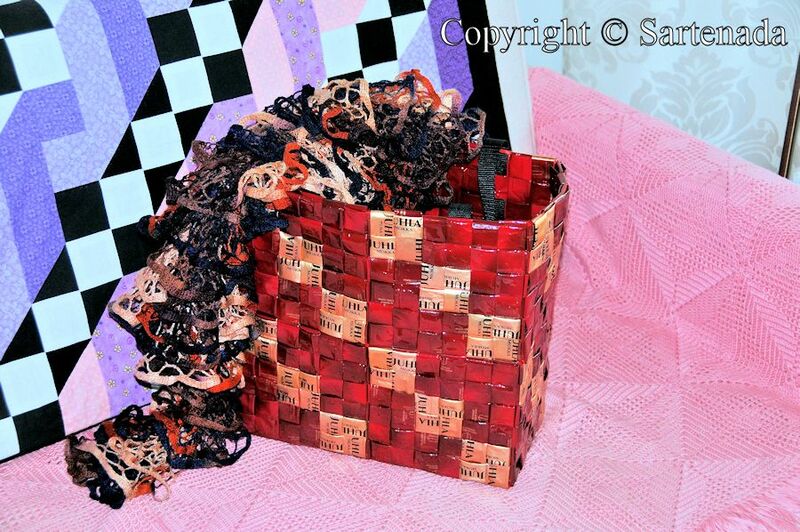 I am glad that You love my post and the idea of making the bag. 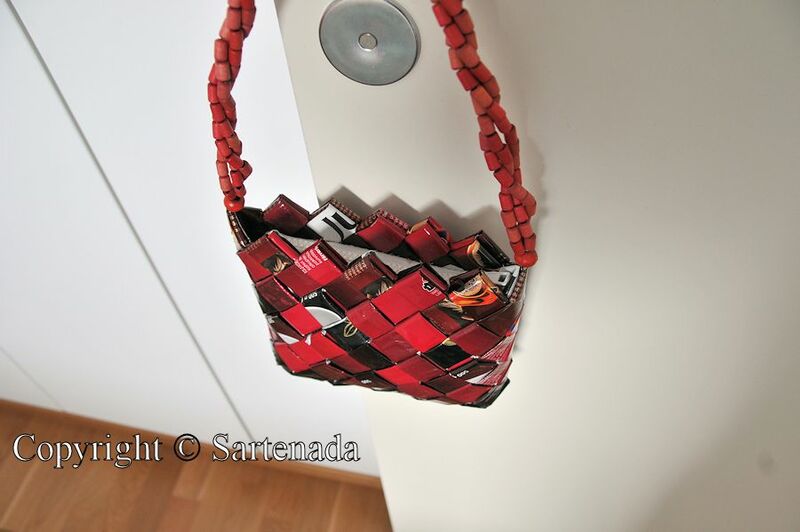 These are really beautiful bags – great pictures! My wife will be happy when I tell Your comment to her. Thank You. Well done! Another great tutorial, great recycling. I love the scarf as well. Zip was not easy, so my wife told and I saw. 🙂 Thank You commenting this post! 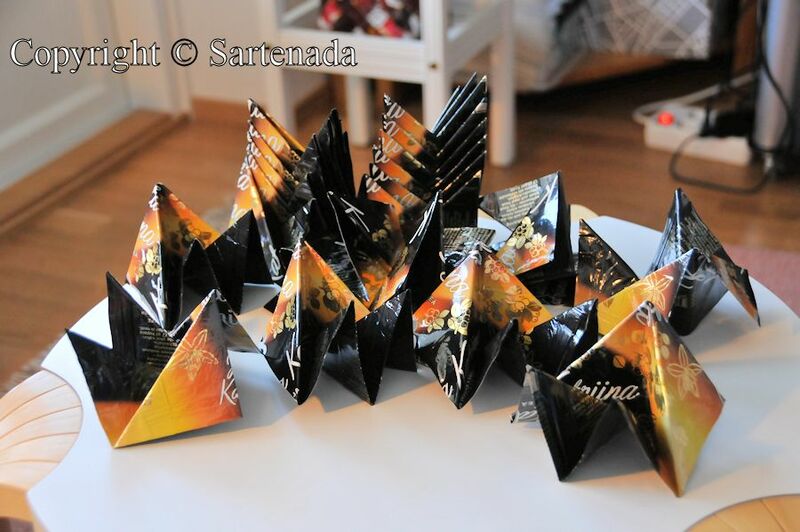 These are beautiful, and what a great idea for recycling… very creative. Thank You for Your praising comment. My wife will be happy when reading Your comment. Another praising comment. Thank You very much.